Have you ever pictured your dream home? If so, do you have a clear picture of it? With the tiny home movement being as popular as it is, there's a very strong desire for individuals to throw themselves wholeheartedly into the trend and adopt tiny living as a way of life. But at the same time, wouldn't it be nice to live in a lovely rustic cabin by the lake? It's a tough decision to make, but a new tiny home company is coming up with ideas that may just allow you to have your cake and eat it too. 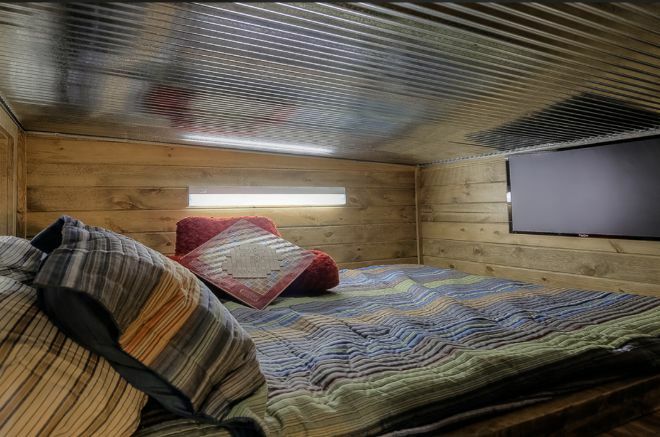 Lon Holden and Robert Wagoner, from Missouri-based Custom Container Living, were willing to reveal the secrets of one of their latest creations with us: A lovely rustic cabin made out of a repurposed shipping container, pictured below. 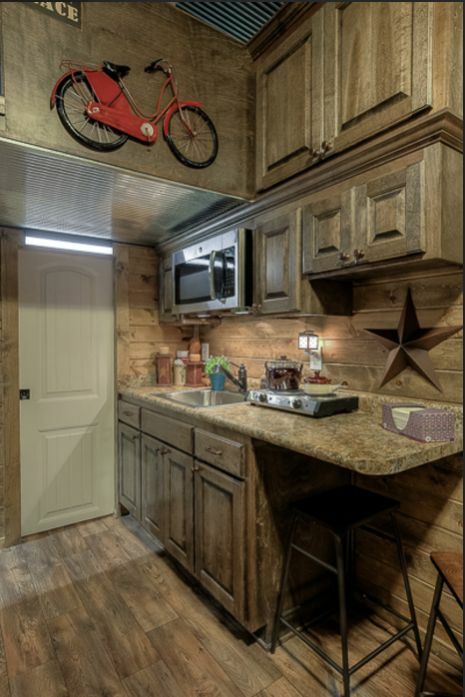 Part recycled tiny home, part countryside getaway, this home may just be the answer to a lot of hesitations people may have about one thing or the other. "One day last May my partner called me up with what he described as 'a crazy idea,'" Holden tells us in an exclusive interview. 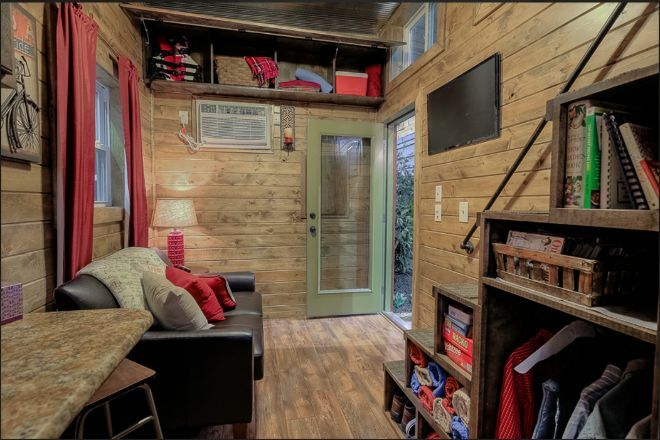 "He said, 'I have been watching one of the Tiny House shows and they built one using a shipping container.' He loved the idea of the container as a starting point due to the structural integrity, mobility, and sustainability aspects." Though this may have once been a shipping container, the house's customizable exterior looks just like a woodlands cabin. 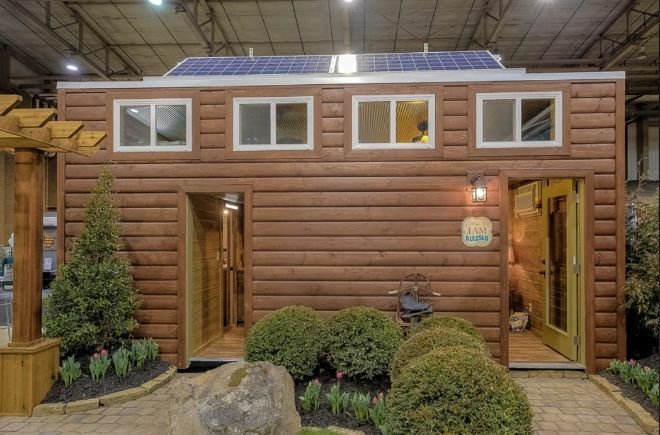 Since the structure is not elevated like most tiny homes, its pine log siding blends in seamlessly with the paved pathways, which are lined with plants of all kinds to make the home feel like it truly belongs. The house contains a fully functional kitchen, with birch cabinets and a Formica countertop which extends 22 inches past the lower cabinets to form an eating area that stools can be tucked under. 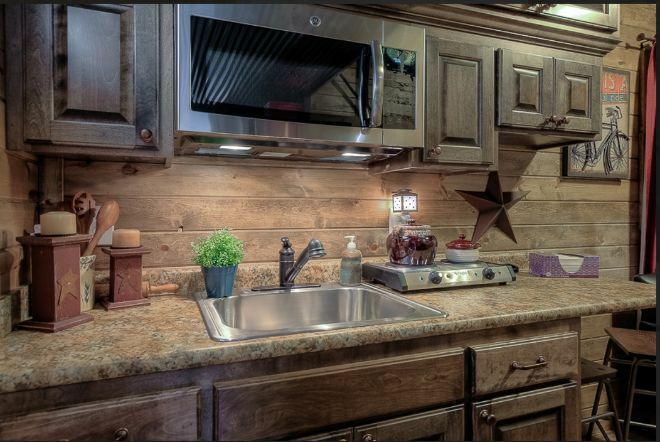 The kitchen is well equipped, with a sink, built-in microwave, and two-burner cooktop which can be stored away if not in use. Across from the kitchen counter, you'll find a refrigerator, washer and dryer. Most importantly, the wood paneling on the walls makes the area look and feel truly comforting. Storage areas line the walls, allowing for a decent amount of belongings to accompany you on your journey into the "tiny life." 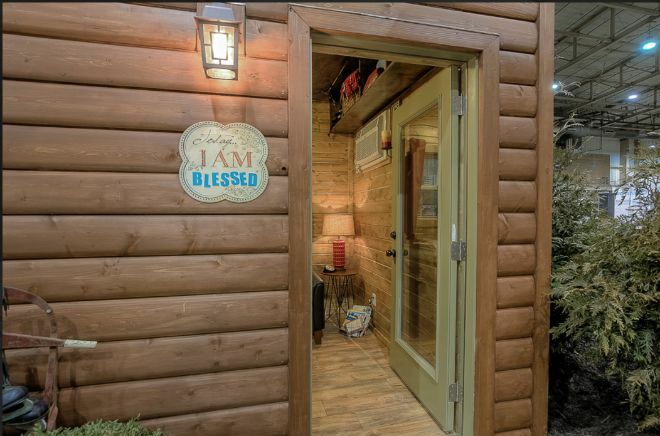 Though the rustic cabin listing says the houses built for customers will come without furniture, this decorated example shows just how cozy the area can feel despite its limited size: 8 feet by 20. 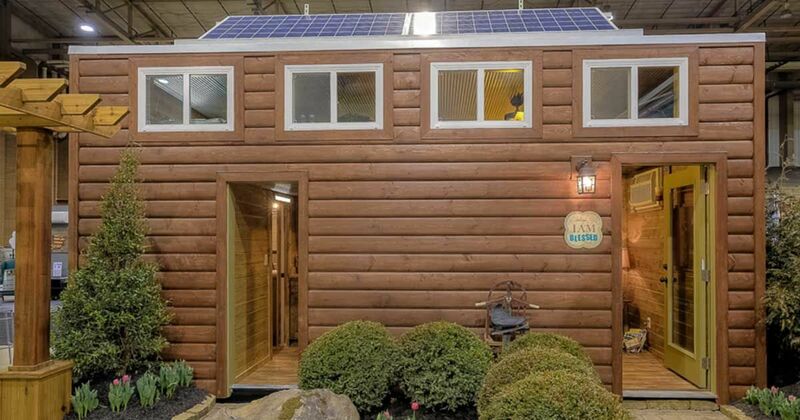 The specimen pictured in this story is the second version of the log cabin container concept, born after the Missouri State Fair last year where the first prototype built was originally put on display. "Over the course of eleven days we had thousands of people come through and they provided us with great feedback. 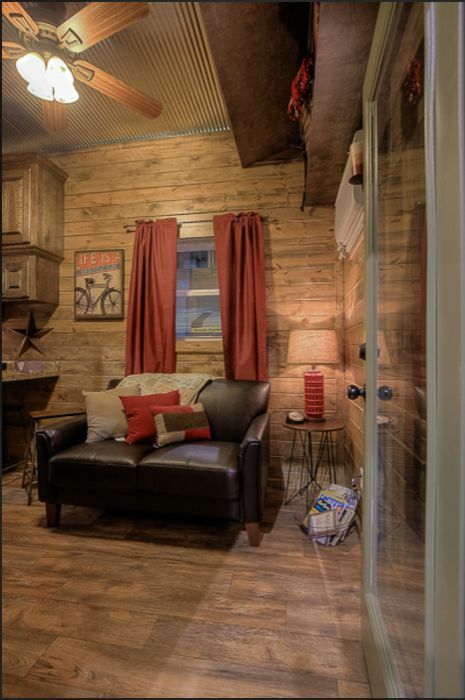 We then took this feedback and incorporated it into this cabin." "The things we found that were important to most people were: Stairs instead of a ladder to the loft, maximum headroom in the loft itself, as much storage as possible, and they definitely wanted a full size bathroom and kitchen area, even when living Tiny. This cabin incorporates all of this." Holden says the company has conceived about 20 different floor plans for the rustic cabin concept, all of which are highly customizable, allowing the customer to truly decide how they want to live. Some of the floor plans are even designed to make this into a second home rather than a permanent place of residence. 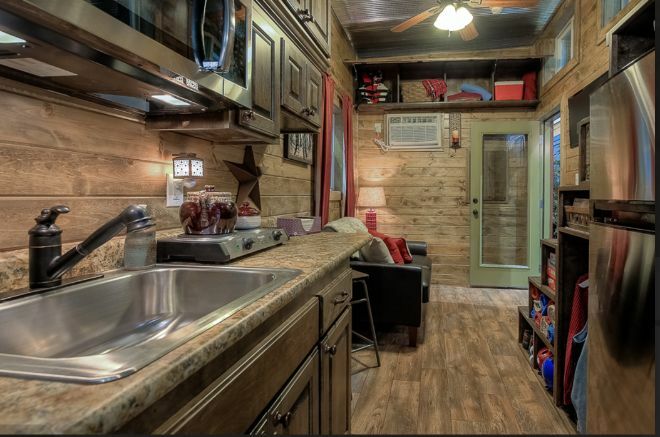 "I would never discourage anyone from building their own tiny home if that is their desire. 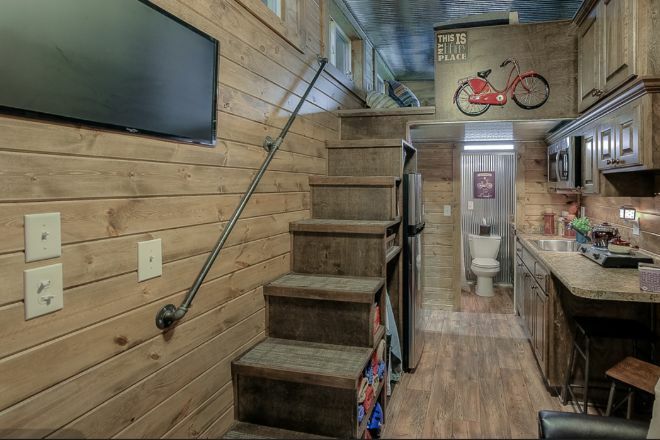 This is a labor of love and can be extremely rewarding," Holden responds when asked about the possibility of a do-it-yourself tiny home dream. Of course, building an entire home from scratch is certainly no walk in the park, and is not for everyone. "If wanting to be involved in the process is important to you, but you do not have the required experience, a good compromise may be to be involved in the upfront design, both from a floor plan and style perspective, and have a professional do the actual building. This way you still have ownership in the process and home itself, but also have the confidence in knowing you have a home of the highest quality construction." Though neither Holden nor Wagoner currently live in a tiny home themselves due to their already large families, they are truly committed to the movement. 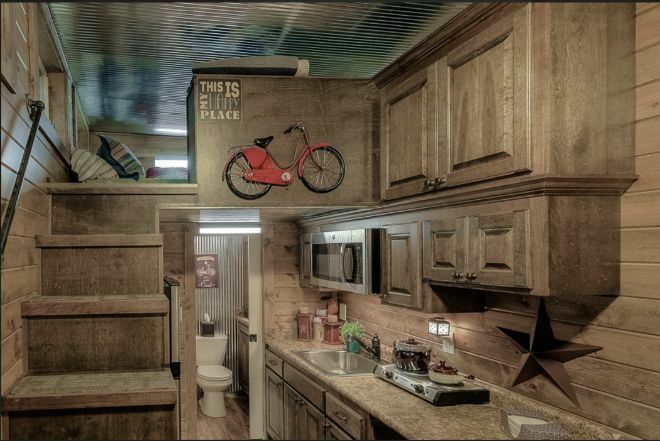 "Tiny living enthusiasts are brought together as much by the common challenges they face as they are by the 'lifestyle' they embrace," he says. "Personally, I would have loved to have one of these when I was first starting out and my children will be living in these during their college years." What do you think of this home? Let us know in the comments section and make sure to share this story with your friends on Facebook!